The Dwarfcraft SheFuzz returns, with cool new tricks! But it doesn’t stop there, the starve controls have gotten a serious upgrade. The “spells” knob controls the degree of power-starvation, but it can be activated by momentary footswitch (“magic”) or left on via the “Hex on” toggle. BONUS! In starved settings, the SheFuzz will self-oscillate in many cool and dirty ways. The Shape knob tends to change the pitch and flipping the “Smash” toggle will shift the oscillation into a higher register. To top it all off, it’s in a little bitty box, leaving a minimal pedalboard footprint. The earliest version of SheFuzz (also known as the Shiva) lives on the pedalboard of Wata, of Boris fame. 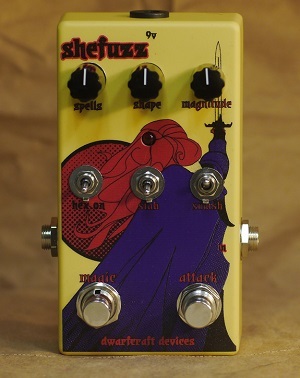 SheFuzz was also the main distortion for Ben Chisolm’s bass on several Chelsea Wolfe tours. We suggest you put everything through your SheFuzz, because destruction is one of the most fun parts of creation! Voltage: 9VDC. 10mA Current Draw. Dimensions: 4.78" x 2.61" x 1.4"